Iran has hanged a man after finding him guilty of spying for Israel's intelligence service, the official Irna news agency says. Ali Akbar Siadat, an Iranian, was executed inside Tehran's Evin prison, according to judicial officials. Irna said he was in contact with the Israeli spy agency Mossad for several years, and had passed on information about Iran's military activities. He was arrested in 2008, when he tried to leave Iran with his wife. Siadat "confessed that he had transferred information to Mossad about Iran's military activities," Irna said, adding that he had "received $60,000 to give classified information to the Zionist regime". He was accused of providing details about military bases, fighter jets, training flights, air crashes and missiles. It was not clear from the Irna report if Saidat was a government employee, or how he obtained the information. He allegedly met his contacts from the Israeli intelligence service during trips to Turkey, Thailand and the Netherlands. 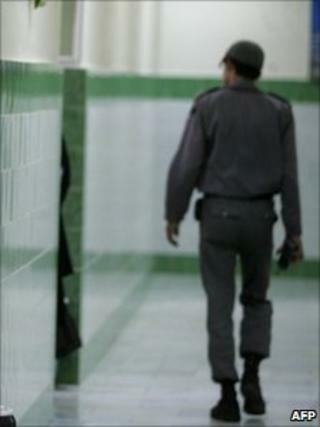 Espionage is punishable by death under Iranian law. In 2008 an Iranian telecoms engineer, Ali Ashtari, was hanged after being convicted of spying for Mossad. Correspondents say Tehran routinely accuses Israel of conducting hostile activities against Iran, including espionage against its armed forces and its nuclear programme. Irna said a second man, Ali Saremi, was also hanged on Tuesday. Saremi was alleged to be a member of the opposition group, People's Mujahideen Organisation of Iran (PMOI) - which Tehran says is a terrorist organisation. He had been arrested several times since 1983. The authorities say that when he was arrested for the final time in 2007, they found CDs, photos and hand-written documents about the PMOI in his house.